I posted the same deal 2 weeks ago when i bought the shower. I've now installed it (very easy as a replacement) and am very happy with it and it's now back in stock. It may be a basic looking shower but a decent brand, 9.5kw, and good reviews. Check Amazon site for configuration options. RRP supposed to be near £100 (Amazon) but a shower for under £50 always seems cheap - under £40 is amazing. On Amazon and Tesco Direct priced at £48 but Tesco also give voucher code of TD-HTWM to get £10 off this price (or any spend over £40 on Home, Cook and Dine). Hope it helps someone. 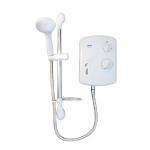 Missed out last time but just ordered now - thanks - not the best shower in the world but replaces a faulty one that came with house , didn't want to spend any more as its only my daughter that uses it to wash her hair. Missed out last time but just ordered now - thanks - not the best shower … Missed out last time but just ordered now - thanks - not the best shower in the world but replaces a faulty one that came with house , didn't want to spend any more as its only my daughter that uses it to wash her hair. I see it's expired but how much would a plumber charge to install this? We don't have a shower only a bath so electrics and plumbing would need to be installed. Great shower at twice the price, proper bargain at this price, almost instant heat. As long as you have good mains pressure you're good to go. Tempted to buy one as spare ! We had one a couple of years ago after our old one went pop.